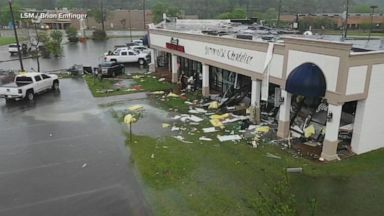 At least 16 tornadoes have reportedly touched down in multiple states including Texas and Alabama. The other major news we're following tonight that devastating tornado outbreak that has taken at least eight lives including two children. More than fifteen reported twisters and tornado watches stretch up to Ohio. A family speeding away with this terrifying tornado in the back window of their car in Hearn Texas. Holmes turned to splinters and blowing away and Hamilton Mississippi also in that state one person was killed in this home in Monroe County. ABC's Marcus mores and also Texas where two tornadoes touchdown. Tonight that deadly storm system on the move. Leaving a trail of destruction across the south killing at least eight and injuring dozens. Or well. In Texas a powerful EF three tornado with 140 mile per hour winds at Franklin. Leveling holds others shredded wood debris scattered everywhere. 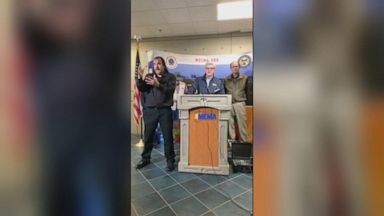 The violent winds flipping over cars and toppling trees leaving thousands without power outages lifted. These are scattered over the radio and this is the spot where about a hundred people gathered for the annual event at that building there are off in the distance the storm coming through. Tossing around these cars and that building took a direct hit. Sadly one person passed away. It Cherokee county people seeing ruins of their homes once stood. We were and also how hit by two powerful tornadoes in ninety minutes and residents came back to their neighborhoods trying to make sense of the unrecognizable. I have is the clothes I have on my bed right now. The winds from the C event so strong uprooting the street. And claimed the lives of a three year old an eight year old Angelina County burn notice that the tree pollen. There wasn't a good out. Mississippi State University telling its students to take cover after a tornado warning was issued. This strong footage revealing the scale of the damage left behind. And farther north this likely tornado claiming another life in Monroe County. This week in nearly 200 incidence of severe weather from Texas to South Carolina. Heavy rain also prompting rescues watch this first responders carry away this woman and a young girl. There SUV got stuck in the flooded ditch and didn't we CNN this elementary school in Golston blanked. Officials say the fire might have been started by a lightning strike luckily no one was hurt. Baucus Moore joins us now live in that town hit by two tornadoes and the devastation everywhere you look Marcus. Get Tom it is everywhere you can see what the storm did to this apartment complex just behind me there were three people inside they managed to escape unhurt. Crawling out of the front door thankful to be alive tonight and Tom this is a scene that is repeated across this region. We see that roof collapse it is incredibly survived drive Marcus thank you. That threat is on the move tonight ABC's senior meteorologist rob Marciano here tracking it you tornado watch as Tom just posted for the coastal Carolinas and also Washington DC and Baltimore we got a tornado warn torn just northwest of DC and look at Chicago five inches of snow there and it's still coming due out. All right the threat tonight is going to be a cross sell Lexington up through Cleveland back to Philadelphia overnight to get dangerous several clusters of thunderstorms will could Jill overnight look at Philadelphia to New York to Albany. My foray and it's pretty nasty in the morning rush for Boston and clearing out and cooling down after that. But there's also a new severe weather threat you're track as well for next week another pretty strong wave come into the Rockies and by mid week it's gonna drop into the plains and look at this huge area. A severe weather potential from Minneapolis to Moines Kansas City Saint Louis back to Little Rock even Dallas. Could see damaging thunderstorms in the possibly tornadoes music summit Darius Thomas got hit with tornadoes this we can OK we'll keep it on that rob thank you.